It's fall in Vermont. You can tell by the snow, that in most other parts of the nation comes in the winter. You can also tell because the Eastern Spiny Softshell turtles that hatched a little late in the season have arrived at ECHO. Each year, Steve Parren, the Coordinator of Vermont Fish and Wildlife's Natural Heritage and Non-Game program, monitors the beaches where softshell are known to lay eggs. Any eggs or hatchlings that Steve finds late in the hatching season are collected and transferred to ECHO for 'over-wintering. More than thirty baby turtles arrived on October 14th, each not much bigger than a quarter. They'll be kept at ECHO until sometime in June when they'll be released where they were found. 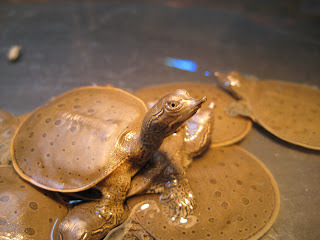 Spiny softshell are a threatened species in the state of Vermont. Come down to ECHO, meet these guys and learn what you can do to ensure their survival in the Lake during one of the animal encounters with animal care staff Tessa and Brian.